Mickey Harris is well known for an impressive amount of self-confidence and for posting a 17-9 record as one of the key components of the starting staff that carried the 1946 Boston Red Sox to their World Series showdown with the St. Louis Cardinals. After his impressive All-Star ’46 season, Mickey struggled to work through arm troubles that kept him from having any further success as a starting pitcher. He did, however, pitch well as a reliever for Bucky Harris’s Washington Senators in 1950 before he retired from baseball in 1953 at the age of 36. Maurice Charles “Mickey” Harris was born on January 30, 1917, in the Belmont Park section of Queens Village, New York. He batted and threw left-handed, weighing in at 6 feet tall and 195 pounds during his playing years. His father, Maurice Sr., was himself a semipro infielder in the New York area. Mickey had a sister, Gertrude, and one brother, Robert. It was in the infield that Mickey, as his father preferred to call him, got his start. At Public School 109, Jamaica Industrial High School, Harris found himself planted at first base, but when circumstances in a doubleheader required a new pitcher, Harris took the mound and never went back. His semipro career began in the Queens-Nassau League, where he used the extra $5 to $10 a game the pitchers earned to supplement his day job of “spraying paraffin on milk containers for a dairy company.”1 In 1937, either through his own motivation or on the recommendation of his peers, the 19-year-old left-hander decided to pursue the next level, ending up at one of Bill Terry’s tryout camps for the New York Giants. In an attempt to launch some modicum of a professional career, Harris received permission to toss batting practice for the Giants, hoping to have his talent noticed. Unfortunately for Harris, the gambit did not pan out. “I’m pitching out on the Island for the Queens Alliance club. We’re playin’ the Belair Civics. The score is tied in the ninth when they load the bases on me. Then I throw my home run ball and everybody walks out on me. “An old guy with gray hair comes up to me. When he asks me what I threw the batter, I think he’s a nosey fan. I told him a hook. He then asked me what my best pitch was. I told him my fastball. ‘Then why didn’t you throw it?’ he says. Back pitching with Clarksdale for the 1938 season, Harris posted a 17-18 record. 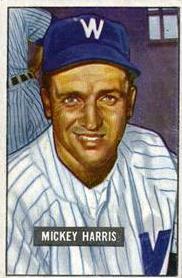 The following year, 1939, Harris found himself at the next level for the Scranton Miners in the Eastern League. There he greatly improved his control and improved his record to 17-4, shared the league lead in winning percentage with a mark of .810, and led in strikeouts with 148 in 184 innings pitched. As his control improved, so did his chances of making the big club in Boston. “In the process of pacing Scranton to a pennant, the pride of Queens Village beat the Springfield club half a dozen times. But when the two rivals came together in the playoffs, Springfield won a close decision. Spencer Abbott, the Springfield manager and no shrinking violet, devoted the afternoon to giving Harris a verbal going over. Spencer used every word in a ballplayer’s book. Indeed, Harris’s prophecy came to pass the following season. Early in 1940, Red Sox manager Joe Cronin decided to carry Harris, on the strength of his 17-4 season at Scranton, and on the show Harris put on at camp. “The Bosox pilot [Cronin] decided to have a look at the young southpaw and as the training period progressed, it was evident that Mickey had a live fastball, a sharp curve, and good control.”10 Still, Mickey’s overconfidence again got higher billing than his pitching talents, as he was overheard remarking in training camp, “The pitchers on this ballclub don’t look so hot. Winning twenty in the American League ought to be a cinch.” His image was further aided by an ill-concealed phone call home, in which he informed his parents that he would be replacing established Red Sox left-hander Fritz Ostermueller. Cronin cracked down on the fresh young southpaw for the remainder of camp, though Harris would come to have the last laugh, as he made the 1940 team. Harris won his Red Sox debut in Fenway Park on April 23, 1940, against the Washington Senators and hurler Dutch Leonard, 7-2. He followed up with a win at Philadelphia over George Caster, 7-3. From there, he slumped, losing to Cleveland’s future Hall of Famer Bob Feller, and earning a no-decision against the Yankees’ Spud Chandler. The sudden drop-off stemmed from the most rookie of mistakes: Harris was tipping his pitches.11 Cronin shipped Harris back to the Scranton Miners in July; in his first major league stint, he’d posted a 4-2 record. As if to demonstrate to the skipper that his decision was ill-informed, Harris went on to post an Eastern League-leading ERA of 2.25. “I knew from the outset, even after winning those early games, that I needed more seasoning. Joe (Cronin) wanted me to throw overhead, because he felt it was my best pitch, and I felt the same way myself. Then from lack of experience, I found myself serving up too many fat pitches, like the day in St. Louis when they hit three homers off me. Harris did remain in Boston for the entire 1941 campaign. He had matured enough to finish the year with a mark of eight wins and 14 losses, and even managed to be selected for the 1941 All-Star team, where he witnessed Ted Williams’ historic game-winning home run to right field at Briggs Stadium in Detroit. Still, the excitement of his debut season was overshadowed by the onset of World War II. Unfortunately, Harris injured his pitching arm in 1943, and was unable to help the Brewers repeat as Canal Zone League champions. Still, he managed to help the Brewers regain their top spot in 1944, and set a Canal League single-game strikeout record by whiffing 20 hitters on March 27, 1945. Additionally, the 26-year-old Harris married Dorothy Elizabeth Baumann in St. Mary’s Catholic Church in the Canal Zone on August 6, 1944. They had three boys: Richard, William, and Kevin. Upon returning from his time in the military, Mickey found himself an integral part of the rotation that helped carry the Red Sox to their first World Series appearance since 1918. Although he didn’t end up reaching his 25-win prediction, Harris did manage to win his first seven starts of the ’46 campaign en route to a 17-9 season record. He was unable, however, to come through when it counted most, losing both of his World Series starts to the St. Louis Cardinals. Harris pitched Games Two and Six, losing to St. Louis lefty Harry Brecheen in both games. Although the final score in Game Two was 3-0, Harris himself was responsible for only one of the runs. Mickey bore more responsibility in Game Six, the Red Sox losing 4-1, handing over three Cardinal runs in the third inning. The real culprit in both losses was a Boston lineup unable to push across any runs. In addition to being his best season, 1946 would turn out to be the only season in which Harris would win 10 games or more. The two closing World Series losses marked the beginning of the end for Harris’s career. In 1947 his playing time was limited to 52 innings as the result of arm troubles that Harris claimed originated during a spring training start against the Cincinnati Reds.16 In 1948, Harris threw 113 2/3 innings but managed only a 7-10 record. A healthier Harris started the 1949 campaign, but after posting only two wins in 37 2/3 innings for Joe McCarthy’s Red Sox, he and outfielder Sam Mele were shipped to the Washington Senators for right-hander Walt Masterson. In Washington the early returns on Harris were equally disappointing. He wrapped up 1949 as a starter for the Senators but managed only two more wins against 12 losses for the capital club, continuing the downward trend. In 1950, however, Mickey’s career picked up some unexpected life. As it turned out, Harris did indeed save 15 games in 1950, to lead the league. He also led the league in appearances, toeing the rubber in 53 games and finishing 43 of them. The key to his success as a reliever was to eliminate his weakness as a starter, namely, his inability to pitch more than a few good innings because of his arm troubles.19 Add a “newly developed slider pitch,”20 and Harris found some late life in his new home. He had a mediocre season on a mediocre team in 1951; Washington’s most successful pitcher was Connie Marrero, with 11 wins. His career in Washington lasted one inning longer, and eight days after the 1952 season began, the Cleveland Indians purchased Harris’s contract from the Senators for $10,000. At 35 years old, Harris was on his way to his third major league club. His stay in Cleveland would be even shorter than in Washington. After tossing 46 innings of relief for the Tribe, Harris found himself placed on waivers at the close of the season. When no claims were submitted, Mickey received his unconditional release on March 27, 1953. With that, his career in professional baseball came to a close, as Mickey announced his retirement that spring. Mickey Harris died of a heart attack suffered while bowling on April 15, 1971. He was 54 years old. 1. Shirley Povich, “Call for ‘Mr. Trouble!’” Baseball Digest (September 1950): 90. 2. Jack Malaney, “Harris, Red Sox Hurler, Labels ‘Pop-off’ Tag as Bunk, but Mickey’s No Mouse in Standing Up for His Rights,” Boston Post, May 20, 1941. 3. Peter Golenbock, Red Sox Nation (Chicago: Triumph Books, 2005) 101. 4. John Drohan, “Mickey Whistles While He Wins -- So Does His Fastball.” Mickey Harris Player File, A. Bartlett Giamatti Research Center, National Baseball Hall of Fame and Museum. 5. Summary of Mickey Harris’s signing and career, May 1971. Mickey Harris Player File. 6. Povich, “Call for ‘Mr. Trouble!’” 91. 7. Jack Malaney, “Red Hot Rookie of Red Sox: Harris Makes Grade on Hill in Hurry,” Boston Post, April 11, 1940. 9. Hub Miller, “The Whistler From Queens,” June 1947. Mickey Harris Player File. A. Bartlett Giamatti Research Center, National Baseball Hall of Fame and Museum. 12. Fred Knight, “Hash, Harris Ready to Make Comebacks,” March 3 1941. Mickey Harris Player File, A. Bartlett Giamatti Research Center, National Baseball Hall of Fame and Museum. 13. “Brother Bob Offered To Serve in Army.” Mickey Harris Player File, A. Bartlett Giamatti Research Center, National Baseball Hall of Fame and Museum. 14. Tom Meany, “Mickey Harris Had Biggest Thrill in Canal Zone,” PM Syndicate, July 8, 1942. 15. Quote from Mickey Harris predicting success in 1946, March 1946. Mickey Harris Player File, A. Bartlett Giamatti Research Center, National Baseball Hall of Fame and Museum. 16. Hy Hurwitz, “Mickey Harris Ordered Not to Touch Baseball for Next Two Weeks,” 26 June 1947. Mickey Harris Player File, A. Bartlett Giamatti Research Center, National Baseball Hall of Fame and Museum. 17. Al Hirshberg, “ ‘Fireman’ Harris Haunts Red Sox” August 19, 1950. Mickey Harris Player File. A. Bartlett Giamatti Research Center, National Baseball Hall of Fame and Museum. 18. Hirshberg, “Harris Haunts Red Sox,” August 19, 1950. Mickey Harris Player File. 19. Hirshberg, “Harris Haunts Red Sox,” August 19, 1950. Mickey Harris Player File. 21. “Mickey Harris Quits Game,” 1953. Mickey Harris Player File. 22. “Maurice ‘Mickey’ Harris,” Farmington Observer, April 21, 1971, 14B. Daniel, Dan. “Daniel’s Dope.” World Telegram, October 7, 1946. Eberenz, Leo J. “3 in Row for Harris in Canal Zone Finals.” May 25, 1944. Mickey Harris Player File. A. Bartlett Giamatti Research Center, National Baseball Hall of Fame and Museum. Feldman, Chic. “Of Mickey Harris Late Pitching Idol.” The Scranton Tribune, April 24, 1971. Grossman, Leigh, ed. The Red Sox Fan Handbook, Everything You Need to Know to be a Red Sox Fan or Marry One, Updated for 2005. Boston: Rounder Books, 2005. “Harris, Red Sox, Is Rated Class 1A of Army Draft.” May 28, 1941. Mickey Harris Player File. A. Bartlett Giamatti Research Center, National Baseball Hall of Fame and Museum. “Harris, Ex-Red Sox, Married in Canal Zone.” United Press, August 7, 1944. “Harris, Mele For Masterson.” United Press, June 13, 1949. “Harris, Mickey C,” Detroit Free Press, April 17, 1971.